The MALP indicates that P3X-289 contains a large dome structure enveloped by a toxic atmosphere. SG-1 travels to the planet and finds within the dome a quaint village within a pristine garden. There they meet Kendrick and his young son Nevin, Pallan and his wife Evalla, and the three men and one woman who make up the village's Council. 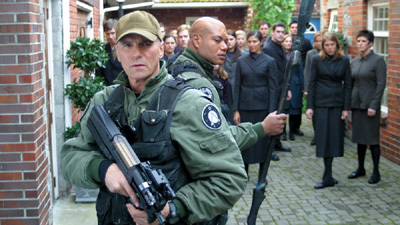 All are warm and welcoming, and invite SG-1 to stay. They also willingly share their technology, including the "link", a small device worn near the temple of each villager that provides a direct neural interface with the computer that controls and protects their village. During the night, the councilwoman awakens and walks in a trance beyond the dome. The next morning, Pallan shares computer technology with Carter, who notices a drop in the dome's power, and fears it is on the verge of collapse, but Pallan insists she is mistaken. When the computer performs an update, each villager pauses to receive information through the link. Afterward, however, no one has any memory of the missing councilwoman, and when Evalla also walks in a trance beyond the dome, and Pallan denies he was ever married, it becomes clear that the village holds a dark secret. When Daniel discovers an ancient document indicating that the village once held a population nearly 100 times as large, the sinister truth becomes clear. The dome is not collapsing. It is shrinking. To compensate for its power loss, the computer is systematically eliminating the population. As the computer undergoes another revision to direct the villagers against SG-1, Carter and Daniel frantically convince Pallan to perform a manual update that will free the villagers from control of the link. Now aware of the fate of their world, the villagers accept SG-1's help to evacuate their doomed planet for a new homeworld. P3X-289 is about 6000 light years from Earth. The atmosphere is completely toxic, containing sulfur dioxide, carbon monoxide, methane, and ammonia. When industrial growth poisoned the atmosphere 400 years ago, the dome was created to maintain the community. The original population was over 100,000. The geo-thermal vents that supply the town’s power started to cool about 200 years ago, and the dome began shrinking some time after that. The current population is 1373, living within a dome about 2.2 kilometers wide and 500 meters high. The inhabitants know the stargate as the Gate of Mahg Mar, discovered 563 years ago, and believed to have been of ritual significance in the worship of the goddess Morrigan.